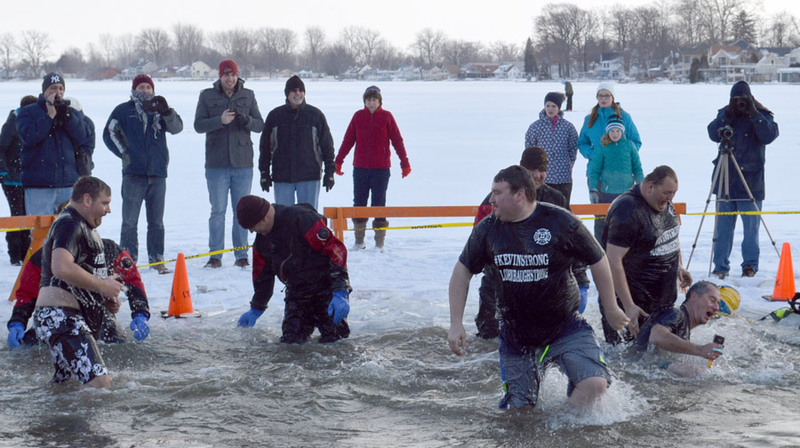 A few Syracuse firefighters participated in last year’s Polar Plunge. This year’s event will be held at Oakwood Resort Beach at 3:30 p.m. regardless of weather conditions. SYRACUSE — The 2017 Wawasee Winter Carnival is back and planned to be better than ever. This year’s event will be held from 6:30 a.m. to 4 p.m. Saturday, Jan. 28. Regardless of weather conditions, all but two events will be held. Most events will be held on Main Street, with other events taking place at Oakwood Resort, Lakeside Park, Harold Schrock Athletic Complex and Wawasee Area Conservancy Foundation. The Wawasee Snowmobile Drags and ice fishing contest have been moved to Saturday, Feb. 11. Events will kick off Friday evening, Jan. 27, with the eighth annual Wawasee Kiwanis Soup Supper from 5-7 p.m. at Syracuse Community Center, to benefit Riley Children’s Hospital and several local youth related charities. Soups from participants in such categories as individual, business, restaurant and non-profit organization will be served and voted on by the public. The cost is $6 for those who would like to attend the soup supper and taste the variety being prepared. Registration to participate as a soup contest entrant is due by Wednesday, Jan. 25. Winter Carnival events begin with the 5K Winter Warm Up, hosted by the Syracuse-Wawasee Trails. Registration begins at 6:30 a.m. With the race starting at 8 a.m. from the Schrock Athletics Complex, 900 W. Brooklyn St., Syracuse. The course will be a lap of the Athletics Complex, then to Main, Lake, John streets and onto Front Street. The course will then go on Medusa Street, onto Huntington, then Boston to Main and taking Portland back to the Athletics Complex for another lap before crossing the finish line. The timed race will have three age groups with a prize for each age division winner. Hot cocoa will be available at the end of the race followed by a short awards presentation. Ice carvers will gather downtown Syracuse at noon, Saturday, Jan. 28, where they will create masterpieces from blocks of ice. Shown during last year’s event is Jay Leahy of Ice Creations. After the 5K swing by Grace Lutheran Church, South Main Street, for a biscuits and gravy breakfast. Proceeds from the breakfast will benefit Teen Parents Succeeding. The breakfast will be served 8-10 a.m.
Wawasee Area Conservancy Foundation will be hosting trail hiking, cross country skiing and snowshoeing if weather conditions allow. 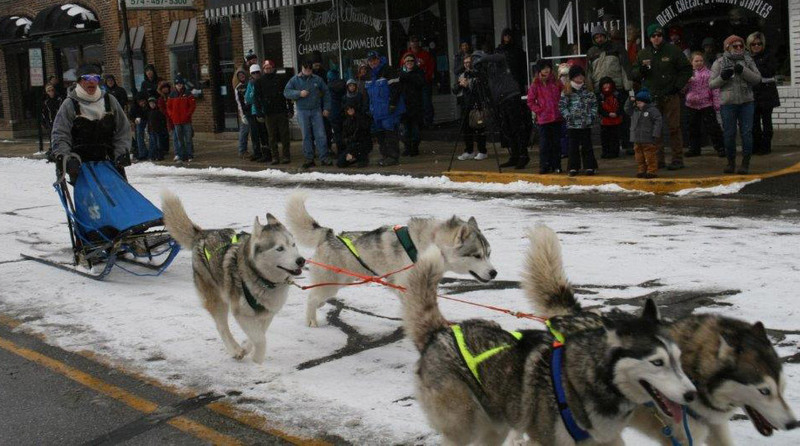 A warming pavilion with refreshments from noon-4 p.m.
Activities on Main Street begin at 11 a.m. With chili being served by the local Cub Scouts and an Iditarod sled dog demonstration presented by Belva Dreer, Fort Wayne, hosted by the Lakeland Youth Center at noon. 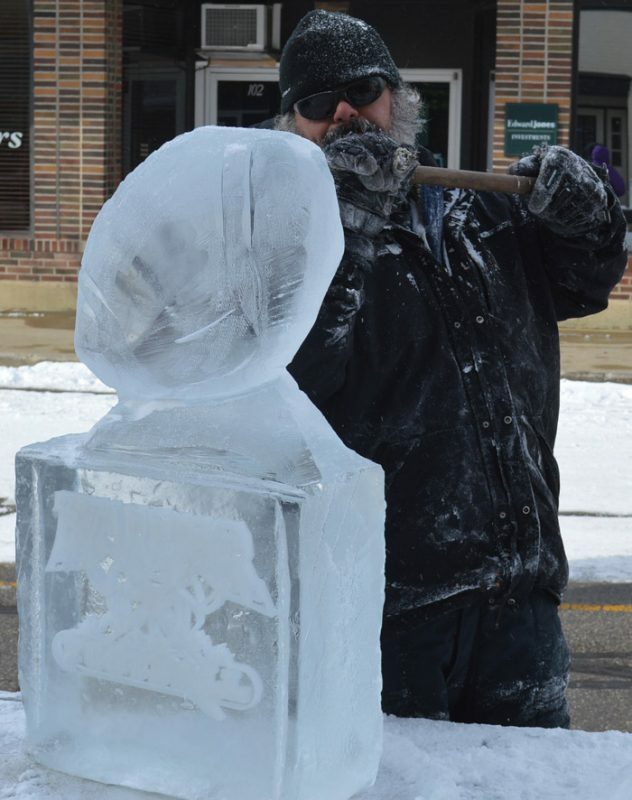 Watch ice carvers create masterpieces starting at noon, hosted by the Syracuse-Wawasee Chamber of Commerce. Head out to Oakwood at 2 p.m. where the local Girl Scouts will be serving hot chocolate and providing s’more packs for those there to participate and watch the Polar Plunge Freezin’ For A Reason at 3:30 p.m. At the Oakwood Resort Beach. Registration will take place at 3 p.m. Participants can be individuals, co-workers, family, or a group of friends. Prizes will be awarded for the best team costume and most team pledges, individual costume and most individual pledges. The event and money raised will benefit the Boomerang Backpacks For Wawasee School. There are registration fees for individuals and teams. Throughout the day, if permissible, the ice skating rink at Lakeside Park will be open. Various food trucks will be present uptown through out the day offering a variety of eats. For those wanting a break from the winter weather, locations along Main Street, such as the Syracuse Public Library, The Lab and many others will be open. The first winter carnival ice fishing derby at Oakwood Resort has been moved to Feb. 11 due to ice conditions. Registration, for the two-person teams, will take place from 6:30 -8 a.m. at the Oakwood Pavilion. There is a fee to register with an additional fee to enter the largest northern pike pot. There is a 15-fish limit of any combination of perch, crappie or blue gill, caught during the derby hours. There are cash prizes for the top three winners. The winners will be determined by the most total weight of any combination of perch, crappie or blue gill. The Wawasee Kiwanis Snowmobile Drags and snowmobile events have also been moved to Feb. 11. Snowmobile events will be at Syracuse Lakeside Park and Community Center, 1013 N. Long Drive, Syracuse. Registration for the snowmobile drags will be from 8:30-10:30 a.m. With races starting at 11 a.m. The Radar Run will be at 10 a.m. followed by the Kitty Kat Races at 10:30 a.m. Lunch will be available at the site. Interested individuals should check wwww.wawaseekiwanis.org for race updates, ice conditions and activities. All proceeds from the event will go to the Wawasee Kiwanis Community Projects, Harold Schrock Athletic Complex and Riley Hospital for Children.